Sharing economy? AirBnB's SF offices are surrounded by homeless people. It’s a noble sentiment. But it belies an awkward reality: Airbnb’s own spacious San Francisco headquarters, so sleek and trendy that Wired called it “the envy of Silicon Valley,” is surrounded by homeless people. Four of those people are the subject of a poignant story and video feature in the Guardian this week. Though they live beneath a freeway overpass directly across the street from Airbnb’s offices on Brannan Street, not one was aware of the company’s existence. He’s right. The sharing economy has never really been about sharing. It certainly isn’t about sharing things with people like Young—which is to say, the people who need them most. It’s about extracting monetary value from resources that are temporarily unused. For Airbnb, that has added up to a reported $20 billion valuation, making it one of the wealthiest private technology companies in the world. That homeless people happen to live near its headquarters is not, of course, Airbnb’s fault. Not directly, anyway. 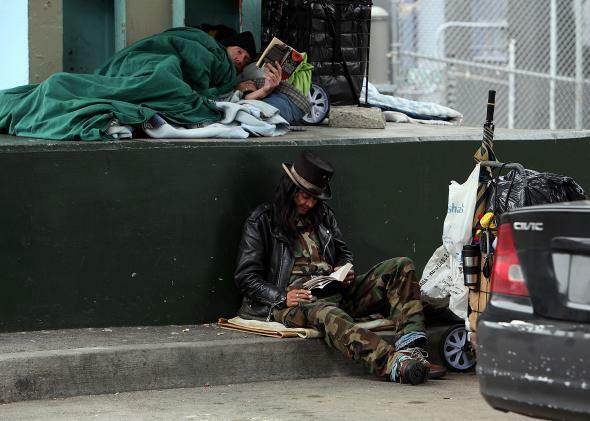 The company inhabits San Francisco’s SoMa district, which has been a haven for the unhoused much longer than it has been a global tech capital. Still, there’s a disconcerting gap between Airbnb’s lofty rhetoric and overflowing bank accounts and the plight of the people who dwell just beyond its doors. The Guardian rightly presents the juxtaposition as a microcosm of San Francisco’s drastic income inequality, which rivals that of Rwanda. The latest tech boom has fueled the highest housing prices in the nation, putting even the most basic accommodation far out of reach for those living in poverty. And there have been stories of San Francisco landlords evicting tenants in order to list their rooms on Airbnb. 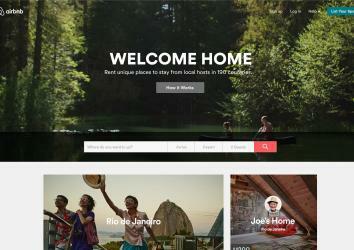 Airbnb’s motto suggests that literally anyone can find shelter among its thousands of listings. Indeed, there are shared rooms available in San Francisco on Airbnb at prices that even some homeless people might be able to afford, if only for a few nights. But Young put his finger on a reality that tends to go unacknowledged by idealistic tech types. Even when the sharing economy doesn’t explicitly exclude those on society’s margins, it implicitly discourages them, both through its high-end marketing and by prompting sellers to publicly rate their customers. The cheapest rooms in San Francisco’s SoMa district are advertised, not as affordable lodging, but as “hacker homes” and “startup houses” targeting a very specific demographic. The full Guardian feature is well worth reading. Its homeless subjects come across as thoughtful observers, both of their own situations and of the fast-changing city whose streets they call home. Far from being anti-technology, they view their smartphones as lifelines and spend hours charging their devices at the public library. John Pobuda, 56, scavenges the dumpster outside Airbnb’s office for discarded extension cords and other equipment. “I guess you could say that makes me part of the technology industry,” he jokes.